The phase of precipitation as rain or snow is fundamental to hydrological processes and water resources. Despite its importance, the methods used to predict precipitation phase are inconsistent and often overly simplified. We review these methods and underlying mechanisms that control phase. We present a vision to meet important research gaps needed to improve prediction, including new field-based and remote measurements, validating new and existing methods, and expanding regional prediction. The transition zone between land and water is difficult to map due to shallow water depth and often challenging environmental conditions. Airborne topobathymetric lidar is capable of providing both topographic and bathymetric elevation information, resulting in a seamless coverage of the land–water transition zone. We present the processing and performance of topobathymetric lidar data along with a geomorphometric and morphological classification of landforms in a high-energy tidal environment. The streamflow recession is the period following rainfall during which flow declines. This paper examines a common method of recession analysis and identifies sensitivity of the technique's results to necessary, yet subjective, methodological choices. The results have implications for hydrology, sediment and solute transport, and geomorphology, as well as for testing numerous hydrologic theories which predict the mathematical form of the recession. In this study a comprehensive model was developed that combines numerical schemes with high-order accuracy for solution of the advection–dispersion equation considering transient storage zones term in rivers. In developing the subjected model (TOASTS), for achieving better accuracy and applicability, irregular-cross sections and unsteady flow regime were considered. For this purpose the QUICK scheme due to its high stability and low approximation error has been used for spatial discretization. Modelling inundations is pivotal to assess current and future flood hazard, and to define sound measures and policies. Yet, many models focus on the hydrologic or hydrodynamic aspect of floods only. We combined both by spatially coupling a hydrologic with a hydrodynamic model. This way we are able to balance the weaknesses of each model with the strengths of the other. We found that model coupling can indeed strongly improve discharge simulation, and see big potential in our approach. We know that climate is changing quickly in the Far North (the Arctic and sub-Arctic). Hydropower continues to grow in this region because water resources are perceived to be plentiful. However, with changes in glacier extent and permafrost, and more extreme events, will those resources prove reliable into the future? This study amasses the evidence that quantitative hydrology modeling and uncertainty assessment have matured to the point where they should be used in water resource planning. The Dutch water authorities face a water awareness gap among the general public, and consider citizen science a possible solution. Practitioners working at these authorities have doubts about citizen motivation and data quality. This systematic study on practitioner’s viewpoints aims to aid the adoption of citizen science by water authorities. Based on structured interviews with 33 practitioners around 48 statements on citizen science, we identified three distinctive viewpoints. A long-term, global, high-resolution, satellite-based precipitation estimation database (PERSIANN-CDR) was recently released. We evaluate the streamflow simulation capability of PERSIANN-CDR over two major river basins on the Tibetan Plateau. Results show that PERSIANN-CDR is a good alternative for a sparse gauge network and has the potentials for future hydrological and climate studies. The streamflow uncertainties are due to the hydrological model parameters and the length of calibration data. Conflicting results on the effect of the land use/land cover (LULC) and climate changes on runoff have been reported for relatively large basins. After quantifying the impacts of LULC and climate changes on surface runoff using the Soil and Water Assessment Tool, we concluded that large-scale LULC has had an important effect on the water cycle and that the conflicting findings on the effect of the LULC and climate changes on runoff are likely caused by uncertainty in hydrological simulations. Upscaling instantaneous to daily evapotranspiration (ETi–ETd) is one of the central challenges in regional vegetation water-use mapping using polar orbiting satellites. Here we developed a robust ETi upscaling for global studies using the ratio between daily and instantaneous global radiation (RSd/RSi). Using data from 126 FLUXNET tower sites, this study demonstrated the RSd/RSi ratio to be the most robust factor explaining ETd/ETi variability across variable sky conditions and multiple biomes. Our analysis shows that averaging over sub-grid heterogeneity in precipitation and potential evapotranspiration (ET), as typical earth system models do, overestimates the average of the spatially variable ET. We also show when aridity index increases with altitude, lateral redistribution would transfer water from more humid uplands to more arid lowlands, resulting in a net increase in ET. Therefore, the Earth system models that neglect lateral transfer underestimate ET in those regions. Gully erosion is one of the most important erosion processes. In this study, we provide new data on gully dynamics over long timescales with an unprecedented temporal resolution. We apply a new Monte Carlo based method for calculating gully volumes based on orthophotos and, especially, for constraining uncertainties of these estimations. Our results show that gully erosion rates are highly variable from year to year and significantly higher than other erosion processes. The possibility of using a short period of streamflow data (less than one year) to calibrate a physically based distributed hydrological model is evaluated. Contrary to the common understanding of using data of several years, it is shown that only using data covering several months could calibrate the model effectively, which indicates that this approach is valuable for solving the calibration problem of such models in data-sparse basins. A new lightning data assimilation method has been implemented and validated within the Finnish Meteorological Institute – Local Analysis and Prediction System. Lightning data do improve the analysis when no radars are available, and even with radar data, lightning data have a positive impact on the results. We also investigate the usage of different time integration intervals: 1, 6, 12, 24 h and 7 days, where the 1 h integration time length gives the best results. We present the first data-based framework for explaining why catchments behave in a non-stationary manner, even when they are unaffected by deforestation or urbanization. The role of vegetation dynamics in streamflow is indicated by similar or greater sensitivity of annual runoff ratio to annual fractional vegetation cover. We formulated a novel ecohydrologic catchment classification framework that incorporates the role of vegetation dynamics in catchment-scale water partitioning. Attributing changes in ET and GPP is crucial to impact and adaptation assessment of climate change over the NCP. Simulations with the VIP ecohydrological model illustrated relative contributions of climatic change, CO2 fertilization, and management to ET and GPP. Global radiation was the cause of GPP decline in summer, while air warming intensified the water cycle and advanced plant productivity in spring. Agronomical improvement was the main driver of crop productivity enhancement. The paper aimed at deriving Kc (AET/PET) for multiple vegetation types and understanding its environmental controls by analyzing the accumulated global eddy flux (FLUXNET) data. We established multiple linear equations for different land covers and seasons to model the dynamics of Kc as function of LAI, site latitude, and precipitation. Our study extended the applications of the traditional Kc method for estimating crop water use to estimating AET rates for natural ecosystems. In this study we propose a methodology changing present-day precipitation time series to reflect future changed climate. Present-day time series have a much finer resolution than what is provided by climate models and thus have a much broader application range. The proposed methodology is able to replicate most expectations of climate change precipitation. These time series can be used to run fine-scale hydrological and hydraulic models and thereby assess the influence of climate change on them. A remotely-sensed water clarity value (Kd) was applied to improve FLake model simulations of Lake Erie thermal structure using a time-invariant (constant) annual value as well as monthly values of Kd. The sensitivity of FLake model to Kd values was studied. It was shown that the model is very sensitive to variations in Kd when the value is less than 0.5 m-1. We proposed a method to calibrate hydrological models by selecting parameter range. The results show the probability distribution can be used to determine the optimal range of a single parameter. Analysis of parameter sensitivity and correlation is helpful to obtain the optimal combination of multi-parameter ranges which contributes to a higher and more concentrated value of the objective function. The findings can provide references for enhancing the precision of hydrological process modelling. This work demonstrates that changes in surface albedo and vegetation, caused by the millennium drought in south-east Australia, affected the atmosphere in a way that decreased precipitation further. This land–surface feedback increased the severity of the drought by 10 %. This suggests that climate models need to simulate changes in surface characteristics (other than soil moisture) in response to a developing drought if they are to capture this kind of multi-year drought. In this study, the rainfall–runoff models of eight international research groups were compared for a set of subcatchments of the Meuse basin to investigate the influence of certain model components on the modelled discharge. Although the models showed similar performances based on general metrics, clear differences could be observed for specific events. The differences during drier conditions could indeed be linked to differences in model structures. Have precipitation extremes and annual totals been increasing in the world's dry regions over the last 60 years? The paper re-investigates the question whether observed precipitation extremes and annual totals have been increasing in the world's dry regions over the last 60 years. Despite recently postulated increasing trends, we demonstrate that large uncertainties prevail due to (1) the choice of dryness definition and (2) statistical data processing. In fact, we find only minor (and only some significant) increases if (1) dryness is based on aridity and (2) statistical artefacts are accounted for. Modelling water flow through chalk (a fine-grained porous medium traversed by fractures) is important for optimizing water resource management practices in the UK. However, efficient simulations of water movement through chalk are difficult due to the porous nature of chalk, creating high-velocity preferential flow paths. This paper describes a novel approach to representing chalk hydrology in land surface modelling for large-scale applications. Some empirical root water uptake (RWU) models were assessed under varying environmental conditions predicted from numerical simulations with a detailed physical model. The widely used empirical RWU model by Feddes only performs well in scenarios of low RWU compensation. The RWU model by Jarvis cannot mimic the RWU patterns predicted by the physical model for high root length density scenarios. The two proposed models are more capable of predicting similar RWU patterns. With a process-based interpretation of electromagnetic induction measurements, we discussed the potential and limitations of such a method for soil moisture mapping. Results will help clarify the complex and time-varying effect of stable soil properties and dynamic state variables on the physical parameters measured, with implications for future studies. We highlighted the importance of time-series data and the need for a multidisciplinary approach for proper interpretation. In developed countries, the majority of fatalities during floods occurs as a consequence of inappropriate high-risk behaviour such as walking or driving in floodwaters. This work addresses pedestrians' instability in floodwaters. It analyses both the contribution of flood and human physical characteristics in the loss of stability highlighting the key role of subject height (submergence) and flow regime. The method consists of a re-analysis of experiments and numerical modelling. Determining atmospheric moisture sources is required for understanding the water cycle. The role of land surface fluxes is a particular source of uncertainty for moisture budgets. Water vapour isotopes have the potential to improve constraints on moisture sources. In this work relationships between water vapour isotopes and land–atmosphere exchange are studied. Results show that land surface evaporative fluxes play a minor role in the daytime water and isotope budgets in semi-arid environments. Travel-time distributions are a comprehensive tool for the characterization of hydrological systems. In our study, we used data that were simulated by virtue of a well-established hydrological model. This gave us a very large yet realistic dataset, both in time and space, from which we could infer the relative impact of different factors on travel-time behavior. These were, in particular, meteorological (precipitation), land surface (land cover, leaf-area index) and subsurface (soil) properties. Determining measures of uncertainty on loads is not trivial, as a load is a product of concentration and discharge per time point, summed up over time. A bootstrap approach enables the calculation of confidence intervals on constituent loads. Ignoring the uncertainty on the discharge will typically underestimate the width of 95 % confidence intervals by around 10 %. Furthermore, confidence intervals are asymmetric, with the largest uncertainty on the upper limit. Commercial microwave links (CMLs) can provide rainfall observations with high space–time resolution. Unfortunately, CML rainfall estimates are often biased because we lack detailed information on the processes that attenuate the transmitted microwaves. We suggest removing the bias by continuously adjusting CMLs to cumulative data from rain gauges (RGs), which can be remote from the CMLs. Our approach practically eliminates the bias, which we demonstrate on unique data from several CMLs and RGs. 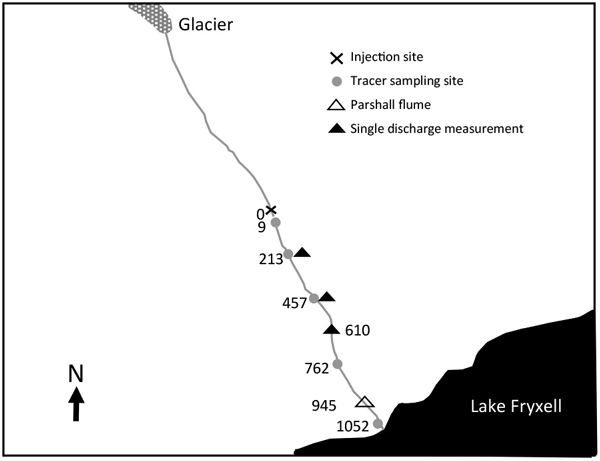 This study examined the potential of snow water equivalent data assimilation to improve seasonal streamflow predictions. We examined aspects of the data assimilation system over basins with varying climates across the western US. We found that varying how the data assimilation system is implemented impacts forecast performance, and basins with good initial calibrations see less benefit. This implies that basin-specific configurations and benefits should be expected given this modeling system. Rainwater intercepted by forest canopies has been suggested to moderate peak pulses of rainfall and resultant pore pressure within soils, thus reducing the risk of shallow landslides. Three years of data in a tropical secondary forest in northern Thailand show that average canopy interception during large storms was only 7 % of rainfall. These peak rain inputs had little effect on soil moisture pulses below 1 m. Thus, canopy interception would have little effect in mitigating shallow landslides.